Hello meat lovers! Kali ini gw cobain wagyu menu yang terkenal enak banget di Hokkaido Izakaya. Ternyata emang beneran seenak itu! Kalo pas weekend, kamu harus reserve dulu karena bakalan rame banget dan bisa2 waiting list loh. Tempatnya tidak terlalu besar dan ada 2 ruangan VIP untuk 6-8 orang. Designnya ala kedai makan di Jepang, jadi teras ambiencenya kyk lagi makan di Jepang. Di bulan Maret, lagi ada promo wine 20% nih. Jadi abis makan wagyu, bisa langsung minum red wine. Pas dateng wiih menggiurkan banget! Daging sapinya menggunung. Dimasak di atas hot pot dan pake chili oil. Jadi ada pedas, gurih, asin jadi satu. Enak banget! must try! Ini omeltte yg aku suka. Bentuknya balok dan diolesin butter, jadi lbh milky dan creamy pas diamkan. Superb! Ini semacam ayam karage. Crispy di luar, empuk di dalam dan ada lemak2nya gitu. Wah yg ini enak bgt! Berasa mirin di kuahnya yg asin dan gurih. Pas dimasak sama chef, aroma beefnya udah bikin ngiler. Porsinya sih personal ya menurutku karena hanya beberapa pcs beef, mushroom, dan sayuran. Recommended! Jangan lupa mencelup dagingnya ke adlam telur sebelum dimakan ya, biar lebih pol rasanya. Ini sushi roll yg isinya 4 pcs. Di atasnya topping wagyu tebal yang enak! Menu yg satu ini presentasinya cantik, dihidangkan di atas lembaran nori dan toppingnya ada golden leaf gitu. Warnanya cantik abnget dan pas dimakan, enak! Empuk dan ga beefy. Wagyu satay yang disajikan di atas gelas yg di dalamnya ada saus sukiyaki, shoyu, bawang, dan telur . Cara makannya, dagingnya dicelup ke dalam gelas, dimakan dengan saus dan telurnya. Yummy! Aburi sushi yg wagyu nya dibakar langsung, terus dituang sausnya dan dimakan dengan telur setengah matang. Enak banget! Berasa banget beefnya dan ada wasabinya juga di dalam sushinya. Overall, semua wagyu dan bumbunya dimasak dengan tepat. Bumbunya meresap ke dalam daging yang empuk. Super yummy. Harga dan rasa sebanding. Worth it guys! Bakalan puas abis selesai makan. Hello salmon lovers! Sebenarnya udah lama banget denger Honu di Kemang, tapi belum kesampean nyobain karena jauh dari rumah dan kalo gojek ke rumah pun terlalu lama. Finally, cobain juga Honu di cabang Menteng. Lokasinya di belakang Sarinah, bersebrangan dengan Gereja St. Theresia. Tempatnya kecil, terdiri dari 2 lantai. Lantai 1 hanya ada 2 meja yang bisa muat 4-6 orang per meja, sedangkan di lantai 2 lebih lega dan lebih banyak meja. Gw pilih makan di lantai 2 yg lebih luas. Isinya ada salmon sashimi cube dengan shoyu (light taste, manis, asin gitu), edamame, wakame, tobiko, dan japanese purple pickles. Nasinya pulen, sedikit sticky spt nasi Jepang pada umumnya. Salmonnya fresh, ga amis, teksturnya empuk banget! original taste dari poke bowl, tapi gw suka karena light dan bisa makan banyak. This is my most favorite bowl! Rasanya gurih, creamy, sweet, dan enak! Salmon dan salmon belly aburinya enak banget, baik dari segi rasa dan teksturnya yang empuk. Buat yg suka mayonnaise, wajib cobain ini! Recommended nih! Salmon dengan miso lemon saucenya bikin poke bowl ini asem manis seger! Misonya agak feremented, sedikit asin, tapi cocok dimakan dengan nasi dan toppingnya. Crispy kalenya yang bikin bowl ini jadi makin mantep karena cripsy banget! Ini adalah salah satu menu yg gw suka dari Honu. Yg ini wajib coba buat pecinta salmon dan tuna. Kalo bingung mau pilih tuna atau salmon, makan aja keduanya di Two n Two bowl ini. Disajikan dengan wakame, lettuce, carrot, tempura crunch, dan pakai creamy sauce enak. Tuna-nya fresh, terlihat dari warna pink kemerahannya yang cantik. Teksturnya empuk, kenyal, dan ga berbau amis sedikitpun. Must try! Matchanya autentik jepang karena pakai matcha powder asli yang dicampur dengan soy milk/fresh milk (bisa kamu pilih mau susu apa) dan honey. Rasnaya enak dan bold! Karena ada honey, makanya matchanya jug amanis alami tanpa penambahan gula lagi. Recommended!! Overall, gw puas banget makan di sini. Selain karena makanan yang enak dan porsinya cukup banyak (kenyang loh! ), harganya juga terjangkau. Servicenya OK, cepat, dan ramah. Tempatnya juga pewe buat nongkrong. Hello meat lovers! I think some of you have already heard that WAKI Japanese BBQ has the best beef in town! That’s right! I agree with them. It’s my pleasure to get invitation from WAKI itself and to make my own HONEST review about their food. WAKI is located in Thamrin, more precisely on the 2nd floor of Metro Coffee. You will recognize the logo (big cow’s head) on the rooftop. The Metro Coffee itself is also pretty and suitable for OOTD photoshoot. Back to WAKI, the place is quite big and spacious. It has 3 VIP rooms which are all connected into 1 big VIP room for an event. The VIP room is very private and soundproof. WAKI has also semi-private rooms in which the place is only separated with partition and not soundproof. So, you can see the dining area from the semi-private room. It is more spacious rather than VIP room. The dining area is the place for less than 6 people. There is also a bar for alcoholic drinks. This place is suitable for holding a celebration or event. WAKI serves you the most excellent quality of beef and halal foods with affordable price. There are promotions for set menu and lunch menu as well for only 49k to 69k, including Rice bowls and Gyutandon with free salad and soup. No pork, no lard. The market target is for middle up section, but the price is not as expensive as I thought before.Since they serve alcholic drinks, they also serve Korean side dishes. They said that Korean dishes are perfect for alcholc drinks. So, don’t get confuse if you see many Korean dishes on the menu book. It still a Japanese restaurant. I could not help myself not to get tempted while looking all of these photos. The kimchi is delicious; not only for the seasoning , but also from the cabbage’s texture. Originally, the cabbage is fermented for 7 days, but in WAKI, the fermentation process is only 3 days. This will result in crunchy texture of the kimchi and less sour. The spiciness and sourness are lower than Korean Kimchi. It is a good point when a Japanese restaurant can make a tasty kimchi. This is my favorite dish. The Salad is fresh and has katsuobushi on top. There is tofu as well. The sesame dressing is very good;with its thick texture and bold taste. Super yummy! It is a Korean pancake with WAKI special sesame sauce. I like the pancake because the texture is so crunchy on the outside and soft in the inside. It is a spicy short ribs beef soup with beef broth and vegetables. The beef is tender and the broth si quite good. For me it is not spicy, only the red colour makes it looked spicy. The chapjae is delicious! The glass noodle is perfectly cooked with the sweet savoury seasoning. Must try! RECOMMENDED! You must order this platter. The platter is quite big and suitable for 4-5 persons. You must eat them with this sequence : gyutan, kalbi, and jyo kalbi. Don’t get mix up since you will ruin your taste palette. The gyutan is so tender, perhaps the best beef tongue I’ve ever eaten. The kalbi is so juicy, meaty, and tender. NEW MENU! It’s less than a month since WAKI serves this menu. The platter consists of the excellent quality of meat in which saikoro is my favorite! You may try the kalbi, jyo kalbi, harami, saikoro, and misuji in Moriawase platter. I think this is the best platter you’ll get in WAKI. MUST TRY! You can eat the beef with their sauce: Sweet onion sauce (my favorite), Lemon sauce, and Savoury sauce. It is a tender long strip marinated meat in a small pot.The ribs is marinated with onion sauce, then grilled and cut into small pieces. You may taste the sweet taste when you chew the meat. This is the most premium and excellent quality of the meat that WAKI has. It only consists of 5 pieces in one plate. The pinkish red colour looks tempting. When you grill the meat, hmmm you can smell the delicious meat. The texture and the taste are excellent. Very recommended! All the set menu include Free soup dan salad.The beef sliced is tender and the sauce is tasty. It’s not the same with any other Japanese restaurant. BBQ lunch set starts from 69k and the rice bowl set meal starts from 49k. Harami : sliced hanging tender, a lean cut of beef with a bold flavor. Rice drizzled with WAKI sauce and topped with nori, scallions, and sesame seeds. The rice is so tasty! Tasted like rice bowl without meat. The mochi ice cream is good. The mochi is chewy and the black sesame ice crema inside the mochi is also good. Yummy! There are 5 flavors of ice cream : vanilla, strawberry, coffee, matcha, and black sesame. The strawberry is made from the fruit itself. You may know it from the gritty texture. The Coffee and Matcha are the best! They are my favorite and not too sweet. Overall, you will have NO REGRET after having your meal in WAKI. They serve the best quality of meat and the price is still affordable. The place is cozy, the service is good, and many selections of meat that you can try. You can indulge yourself in WAKI and I guarantee that you will satisfy with the food. Happy eating! Hello food lovers! When I visited Hong Kong, I purposely went to Dim Sun Icon. 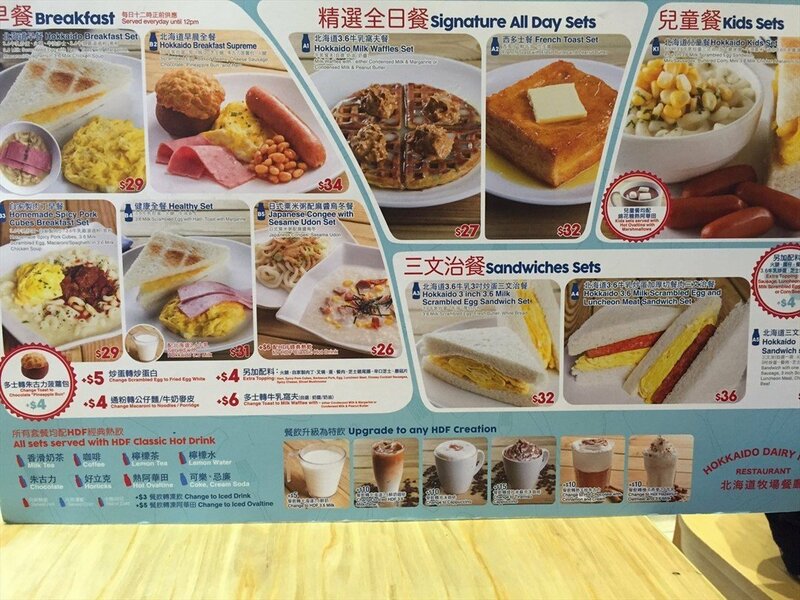 This cafe is located on the 3/F of The ONE Mall, Tsim Sha Tsui, Nathan Road. This mall is quite instagramable because there are many manga exhibition and cartoon characters stores in this mall. Oh yeah, opposite to Dim Sum Icon, there is also a very cute cafe full of 365-days-bears. Dim Sum Icon does frequently change their cafe’s theme. The most popular theme was Gudetama. When I visited there in 2016, the theme has changed into another theme (which was not cute at all). So, I decided to re-visit Dim Sum Icon in 2018. Lucky me, I found Garfield for the theme! Garfield is the fat cat cartoon character since I was a kid. The cafe is small, but so cute! All area in this cafe is dominated by Garfield’s picture (yellow-orange colour). Even the table set and book menu are dominated by Garfield’s pictures. The foods are quite expensive since they have to pay the license’s of the theme. If you do not buy any kind of drink, each person will be charged HKD 10+ for hot tea. You may select what kind of tea do you prefer, though. It is called as lemper in Indonesia. Most people in Hong Kong will eat glutinous rice instead of steamed rice. This menu consists of 2 layers of glutinous rice and shredded chicken in between. The top part is like an omelette, but steamed. The happy face of Garfield is cute! The taste is okay, not too salty. Consist of 2 pcs, the porcupine fried buns are so cute! The outer part is so crispy (you can hear the creak sound when you bite it). The inner part is softer, filled with melted salted egg. However, the taste is not salty, but sweet, creamy, butter, and eggy. I think it is considered as sweet fried buns, not the savory buns. The fried wonton is cute with those eyes. I think the eyes are made from candy because the texture is hard. The wonton tasted good, but not addicted. It looks cute with the head and tails of Garfield. It seems like the body is the panna cotta. I think that this is the best among the other foods I ordered. The panna cotta is smooth, soft, and has both mango aroma and taste (not artificial, maybe they use real mangoes). I like it! It looks small, but you will get full if you eat them all. The taste is not too sweet, which is good. Overall, the foods are good, but pricey. I think it’s fine to try the foods here because Dim Sum Inc offers you a new look of eating dim sum. There are lots of dim sum places in Hong Kong, but this is the most unique place to spend since every 1-2x per year they change the theme. you will do re-visit again because the theme has changed. Di Enmaru ada set menu dan ada juga all you can eat – sistemnya by order, bukan buffet/prasmanan yang mabil sendiri. Jadi, kamu pesan makanan yang ada di menu, boleh aja semuanya asal dihabiskan ya. All you can eat nya hanya ada di hari Sabtu, Minggu, dan public holiday mulai pk 12.00 – 14.30 WIB (last order). Servie di sini awalnya cepat, tapi karena all table dibooked (full capacisty), jadinya mereka kewalahan dan makanan yang keluar tidak sesuai pesanan. Ada juga makanan yang nyasar di meja lain. Need to improve their service. Mejaku cukup banyak memesan sushi, sashimi, kushyiaki, dan appetizer. Minumnya free flow ocha. Presentasi untuk hampir setiap makanannya cantik untuk difoto, seneng deh! Chawan mushi-nya kecil, imut, dna enak! Ga amis telur maupun foie gras padahal gw bisa mual kalo makan yang amis. Sausnya enak karena gurih, manis, dan pas banget. Tekstur telurnya mirip custard pudding. Must try! Chawan mushi disini beda sama chawan mushi yg pernah gw coba. Chawan mushi 2. Penampilannya simple dengan potongan wagyu di atasnya. Rasanya agak manis, not so good for me. Wagyu nya empuk dan enak. Kita pesan ebi tempura dan ebi tempura dengan saus mayo. Gw lebih suka ebi tempura original walaupun sausnya plain. Yang ebi mayo enak, tapi biasa sih. Mirip udang mayonnaise. Menu ini custom, harusnya unagi-nya disajikan dengan nasi putih. Karena udah pada mulai kenyang, jadi kita order tanpa nasi. Unaginya enak banget! Crispy, ga amis, dan sausnya manis gurih enak. Gw cobain lidah sapi untuk pertama kalinya (alergi sapi nih!) karena penasaran pada bilang enak. Benera enak! Dagingnya empuk dan ga bau beefy seperti daging sapi pada umumnya. Sausnya kurang enak walaupun dagingnya ayamnya cukup enak. Gw paling suka yg spicy miso dari 3 jenis saus : Negi Shio, Basil, dan Spicy Miso. Sushinya di-deep fried, makanya mantep! Unaginya crispy dan cheesenya berasa. Penampilannya unik karena sushinya warna hitam. Cream cheesenya kurang berasa, tapi overall lumayan enak. Baso tusuk dengan saus cheese, tare, dan spicy mayo. Gw paling suka spicy mayo, tapi overall biasa aja sih. Enak! Sushinya kecil tapi aburi salmonnya banyak. Presentasinya cantik semua (ada yang di big plate maupun di boat) dengan dry ice yang bikin looksnya mewah. Sashimi-nya fresh semua, empuk, dan ga amis. Recommended! Tofu nya lembut & enak. Wakame saladnya enak dan gurih. Seger! Porsinya juga banyak. Babinya enak tapi berlemak. Aromanya harum dan bikin laper. Tingkat kematangan babinya OK, dagingnya empuk, dan sausnya enak semua. Must try! Sobanya enak dan kuah dashinya light. Enak dan agak manis kuahnya. Kalo yg udon, kuahnya disiram panas-panas dari teko. Bagus buat difoto dan udonnya juga enak. Rasanya mirip Tofu Salad, tapi toppingnya salmon sashii fresh. So delicious, so fresh! I love all the salads! Salmon-nya enak, saus teriyakinya pas. Perfect! Tapi jangan expect salmon skinnya crispy seperti chipsnya soalnya ini di-grill, jadi ga mungkin crispy. Stir-fried tuna dnegna ginger sauce. Enak dan ga amis. Dagingnya empuk dan sausnya bikin nagih! Must try! Sebenarnya, masih banyak menu lain yang gw coba, tapi yang membekas di lidah gw adalah 16 menu di atas. Overall, tempat ini termasuk ok untuk all you can eat seharga 400k++ karena menunya premium quality. Makan di sini sepuasnya dengan kualitas terbaik deh! Christmas is coming! Have you chosen a right place to celebrate Christmas with your loved ones? If not, then you should go to Bottega Ristorante. This place is beautiful, homey-like atmosphere, and elegant. For me and my friends, we choose Bottega to celebrate Christmas. Bottega Ristorante was in Kuningan and now, reopening again with a new concept and new menu. The decoration is quite similar with the former place, but it’s wider and more elegant. The dim light makes this place feel romantic, homey, and cozy. We choose the back side (besides the bathroom and kitchen) because this place is more private and suitable for 8-10 persons. The dining area looks like at our pantry at home. The decoration of Christmas is beautiful and many spots for OOTD photoshoot. There are outdoor area for smoking and indoor area for non-smoking. Both are beautifully decorated. The service is excellent. The waitress and waiter are so nice and helpful. They treated customers like a king and queen. Here are some OOTD photos at Bottega Ristorante. Kibo Cheesecake which is popular with the melted japanese cheese cake, has launched their new flavor: STRAWBERRY CHEESE! The sweet, sour fruit makes this Christmas become perfect! So fresh, cheesy, and be addicted! Must try guys! You can go to their nearest outlets at PIK Avenue, Kota Kasablanka Mall, and Grand Indonesia. Check out their Instagram @kibocheese for more information. It’s a Norwegian Salmon served with seasonal vegetables. The appearance looks beautiful and tempting. For me, the salmon is perfectly cooked, tender, not fishy at all. One portion is enough, not too small. The presentation is good and simple. For me, the beef steak is well-seasoned, but the taste is below my expectation. The texture of the meat is not tender, quite hard, although it’s medium rare. MUST TRY! The oriental sauce tasted perfect with the crispy-tender pork belly.So delicious! The baby potatoes are sweet and well-seasoned. Must Try! The appearance is simple, but you could smell the tasty truffle sauce! The noodle is like’bakmi’, chinese-style noodle with chewy texture. Surprisingly, this chinese noodle taste soooo delicious with the western-style truffle sauce which is creamy. The portion is quite big for one person. The gnocchi is cooked with pesto sauce. The texture is not as chewy as I thought. It’s lie eating glutinous rice. Somehow I like it, but my friends don’t. So, it depends on your taste palate. The portion seems small, but it’s better to share with 1-2 persons since the creamy cheese sauce is too much for 1 person. Actually, the creamy cheese sauce is good, but it’s too much to finish all at one whole portion. The pretty tiramisu cake is perfect for Chritsmas dessert! The coffee taste balances the sweet-creamy taste of the cake. Sweet and tasty! Overall, we like the food and service at Bottega. The place is also good for celebrating special event such as birthday, bridal shower, romantic dinner, Christmas, and many more. The price of the F&B is quite pricey, but worth it for us. The warm service from this restaurant feels like we are eating at home. Hello cheese lovers! Kali ini gw dapet kiriman cheese cake (mini size) yang lagi hits di Jakarta, yaitu Kibo! Yg bikin special dari cheese cake ini adalah isinya. Ada berbagai macam : Original (melted cheese), Choco cheese, Matcha, Salted Egg, dan Mango. Pas kalian potong cakenya, isinya langsung meleleh gitu. So yummy! Kalo males di-microwave, kamu bisa diamkan cheese cakenya di suhu ruang selama 30 menit biar melted secara perlahan. Untuk kedua flavor ini, kamu bisa makan dingin-dingin (disimpan di kulkas) atau dibiarkan di suhu ruang selama 30 menit (nanti akan melted sendiri) tanpa perlu dimicrowave. Best served in chilled condition. Cukup dimasukkan ke kulkas. Pas udah dingin, langsung deh disantap. Yummy! Gw dapet kiriman 4 flavor nih : Original, Salted Egg, Choco Cheese, dan Mango. Semua size Mini ya. Isinya melted cheese yg enak dan ga eneg menurut gw. Not too strong, not fermented yet, but the taste is good! Enak kok! Buat yg kurang suka cheese, kamu bisa cobain choco cheese. cokalt nya mild, tetep balance dengan cheesenya. Gw suka banget sama coklat dan gw merasa kurang strong coklatnya, tetep cheese yg jadi pahlawannya. Ini salah satu favorit gw. Telor asinnya cremay, andy texture, dan masih berasa gritty pieces dari telor asinnya. Enak! Asin gurih manis jadi satu. Overall, gw udah 3 kali beli di Kibo (ga termasuk endorse ya) dan belum pernah kecewa. Cakenya selalu enak, fresh from the oven. Ingredientnya pasti yang bagus dong. Untuk harga, masih affordable kok. Kalo kamu beli 4, nanti ada potongan harga. Buat yang belum nyobain, yuk buruan dicoba!